Exclusive dealer of Wood-Mode and Brookhaven by Wood Mode Cabinetry. For now 30 years we have been redesigning living spaces, providing homeowners with long lasting value that transcends design and market trends. We believe good design does more than restyle a room, we believe it builds value, beauty and functionality to a home. In 1977, an idea was conceived: A unique retail concept giving the public the ability to create the kitchen & bath of their dreams by employing a fundamentally sound structure from the bottom up. Jennifer Howard founded JWH Design & Cabinetry in 1996, in Rye, NY. A business degree in marketing, a natural ability for design and architecture, and first-hand experience in construction became the foundation of her business model. Her visions have transformed many non-descript houses into stunning homes that have been featured in local house tours and publications. Every JWH Client works with Jennifer on the initial design process, working through the critical decisions that set the path for the entire project. Jennifer remains involved with each project, and provides her stamp of approval on all decisions. Every JWH Team member has their own specialized skill, from technical drawings, plumbing selections, and tile design, all the way through the final paint colors and installation supervision. The JWH Team all works together on every project to make sure each Client is handled expertly and efficiently from beginning to end. Jennifer and the JWH team offers dedicated, personalized services with meticulous attention to detail. In addition to creating innovative, functional and unique custom cabinetry, we offer a range of design services that include architectural design, space planning and furniture layouts, full cabinetry design, custom millwork design, plumbing and electrical design and selections, tile selection, as well as full General Contracting services in NY and CT. We understand how to pull all the decisions together that reflect your needs, offering our honest and unbiased advice, while always respecting the overall budget for the project. Jennifer’s design and planning expertise is not just a product of her work experience, but also her personal experience. She lives and works in Rye, NY with her husband, Rob, who handles the construction side of JWH, five children and dog. She has moved 25 times in 28 years of marriage and has learned first-hand the importance of creative design, careful planning, and efficient execution. German Kitchen Center is a full service European-styled kitchen company that features award winning kitchen brands Leicht, Nobilia and Team 7, leaders in German and European luxury kitchen systems. Our wide range of elite European kitchen systems are on the cutting edge of German engineering and represent the latest design trends and kitchen innovations in the kitchen cabinet manufacturing industry. 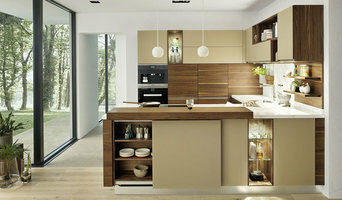 German Kitchen Centers' vast array of European style kitchens feature customizable design solutions that offer roughly 2,000 color options, a wide variety of finishes, and are designed to match your unique personal style and space. Our kitchen design professionals are well versed in designing and transforming spaces for a wide variety of projects; from working with smaller cooking areas to full chef kitchens, we’ve got the knowledge, taste and skills, to transform your current space into your dream space. Our designers work directly with you to transform the existing kitchen, into a space that is astoundingly unique while still practical and compliments your needs. At the German Kitchen Center, we utilize only the finest materials that meet strict German manufacturing standards to ensure your cabinets, lighting fixtures, appliances and cooking bays are built to last. Merit is a family owned business with six showrooms across New Jersey and Pennsylvania. We carry premier brands and offer award wining design. For over 50 years, we have supplied cabinets, counters, vanities and more throughout the tri-state area. If you are building new or remodeling, call or email to arrange a visit to one of our showrooms today. Our experienced designers and sales staff will be sure to meet all of your cabinet design needs. Appointments are appreciated. We look forward to making your cabinet dreams come true. Cabinet Plant is a bespoke design-build company that specializes in custom cabinetry with a particular mastery in high-end kitchens, and has partnered with both European and American manufacturers in order to ensure that clients receive the best possible quality. After more than a decade of experience in real estate development and custom home building, we felt there was a void in the market. We wanted to be able to control the process so that every project we did would get that unique look. Our goal was to bridge the gap between the construction and design process. Now, we fine tune this process and put together a cohesive plan in one location, as a one-stop home improvement and cabinet company, able to seamlessly execute every aspect of a renovation. We go to great lengths to understand our clients’ style, then develop a renovation that adheres to that style while creating a lasting, quality design. We revive natural craftsmanship, beautifully crafted cabinets and vanities that never lose their luster, combined with developers, architects, and interior designers all working together to create a beautiful, comprehensive style throughout the home. That’s what our business is about. Give us a call, message, or visit us in our state-of-the-art showroom, designed and created by our own in house architectural design team, today to learn how we can partner with you on your project! We are proud to bring LEICHT, a brand internationally recognized for top quality kitchen design and cabinetry, to Westchester County. A LEICHT kitchen is 100% customizable and offers more finishes, door styles, cabinet hardware options, and lighting options than any other European manufacturer. The kitchen is and always will be the heart of the house. That's why we have one simple goal: create inspirational kitchens that our customers love to proudly display for years to come. Our professional designers offer dedicated personal service and assist clients with every stage of the project from the initial consultation, to the design phase, and through the selection of products. Our showroom is equipped with state of the art technology that our designers use to present kitchen plans in 3D. Our plans contain all the details from hardware to organization. The best way to imagine your new kitchen is to leave nothing to imagination. We pride ourselves in our dedication to clients and work closely with designers, architects, and contractors to ensure the installation is seamless. All to deliver dream kitchens that are nothing short of perfection. “Do What You Love, Love What You Do“ is the main motto of our firm’s two principals: designer-Paulina and master cabinetmaker-Albert. AhA!nteriors primarily specializes in fabrication and installation of architectural cabinetry, custom furniture and millwork for residential and commercial interiors. Our services include design, preparation of detailed shop drawings, fabrication and installation. AhA!nteriors also does complete residential renovations that include flooring, tilework, door installations, painting, wallpaper, electrical and plumbing work. AhA!nteriors provides design services with 3d visualization and detailed shop drawings. AhA!nteriors is a family operated business with two principals Paulina and Albert. Albert is Paulina’s brother-in-law. The construction field is run by Andrzej who is Paulina’s father and office is run by Danuta who is Paulina’s mother. AhA!nteriors projects include residential and commercial interiors. We welcome General Contractors, Architects, Design Professionals and Private Clients. Since AhA!nteriors is a small boutique company clients are guaranteed that their projects would be handled and supervised mainly by the principals. Kitchens are our specialty. We work with our clients from start to finish, paying attention to every detail in the process. We are dedicated to delivering individualized design service and high quality craftsmanship. Let us create YOUR beautiful space! Ackley Cabinet LLC is a unique kitchen remodeling company that transforms your existing cabinets into new custom cabinetry. Using only the highest quality materials, we developed our system to offer a blend of existing cabinet interiors with custom outside pieces that offers a superior result. As a full service firm, our staff will be happy to guide you through the kitchen remodeling process as well as provide coordination services for all other aspects of your project. Your kitchen project deserves to be treated with personal service and attention to detail in order to make your dream a reality. Beginning with our first contact, our design team will meet with you in your home to discuss your ideas and goals. We are committed to providing our clients with the highest level of customer service and workmanship to ensure all phases of the project will be completed seamlessly. Established in 1971, Ackley Cabinet LLC has remained a local, family owned business proudly serving Fairfield and Westchester Counties. Looking for a total Kitchen Remodel as well as new granite or quartz kitchen counter-tops? Here at Heart of the Home Kitchens we do it all! OUR VISION: We believe the kitchen to be the heart of any home. It is the place where family and friends gather, the place where great care and thought go into every meal. It is the place where the aroma of your culinary culture welcomes all who enter your home. It is where we want to be! In a sea of companies selling kitchens, what makes Heart of the Home unique? Our greatest asset is the fact that building fabulous kitchens is not our job, but a true passion! From designing Kitchen Cabinetry, custom Kitchen Countertops and everything in between - it is all about the details at Heart of the Home Kitchens. GENERAL INFORMATION: We maintain kitchen cabinet and countertop lines that share our passion for fantastic quality and design. We make it a point to travel to our manufacturers' fabrication facilities. We want to meet their CEO’s and understand what makes them tick. We look at their cabinet manufacturing efficiencies and the work ethic of the guys in the shop. If we see lackluster dedication or quality control, we move on, regardless of the size of the name. We make kitchens designed for the way YOU live. We are only interested in placing the best quality of kitchen cabinetry, at the best value, in your home! Please visit us at our showroom 30 Nixon Lane - Unit 1A, Edison, NJ 08837. Sterling Kitchen Design, renowned for its expertise in custom kitchens to suit every budget, is based in Long Island NY and was founded by owner and president Ellen Lagoudes. 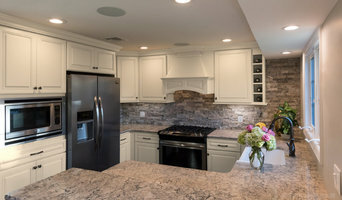 While Sterling is best known for their custom work, their services also include custom, semi-custom, stock cabinetry, counter tops, appliances and tile. Sterling’s success comes from their commitment to detail and from customer satisfaction in a job well done. Ellen Lagoudes is an 23 year interior design veteran whose passion lies in kitchen design. Ellen developed an interest in kitchen design at an early age and pursued her passion at the Metropolitan Institute of Interior Design. Though she excelled in kitchen, bathroom, dining room and living room design, her true love has always been kitchens. After receiving her design credentials, she set out of find her own style. Her quest found her! After apprenticing with different kitchen designers and being exposed to many different styles, Ellen now boosts an impressive portfolio of her own unique style which has been featured in House Magazine and Cabinetry Calendars. Sterling Kitchen Design’s promise is pride of workmanship and their commitment is providing you with the highest level of personal service and satisfaction. Founded by Mikheil Karanadze, Geowood Design Incorporated is a multi faceted carpentry and design firm that specializes in both: home improvement and custom design of furniture, as well as installation of all things build by them. Coming from a background as an independent contractor, then graduating to building as a working partner for multiple design companies... Mikheil's experience spans over two decades. Now with a proficient team of builders, woodworkers, and designers, Geowood has an international client base spanning from NYC to Europe and back. Regardless of a space size, limitations, or the overall vision- big or small, Geowood is able to make your comfort desires for living space, store, gallery or office a reality. After 10+ years of gaining experience in the industry, Mendel Barber decided it was time to create his own company, and Crown Woodworking was incorporated in 2011. Crown Woodworking is a fully licensed, fully insured New York City contracting firm specializing in kitchen remodeling, kitchen cabinetry, and creating custom-designed furniture in our own Crown Heights-based workshop. We also design and remodel bathrooms, living rooms, closets, and commercial spaces, and are always open to new challenges! We offer free consultations with in-home estimates to all prospective customers. We will meet with you one-on-one to discuss your vision for the project, choose from a range of cabinet, counter top and hardware options in our showroom, create and tweak layouts in our state-of-the-art software, and determine the best approach to getting the job done, with your satisfaction as our top priority! Please don't hesitate to drop us a line or give us a call today! When you think about cabinets, your mind probably goes straight to kitchens and bathrooms. 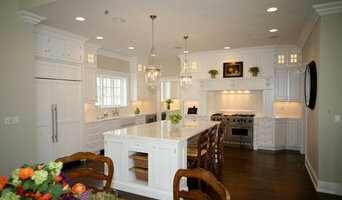 But Copiague cabinetry professionals’ abilities extend far beyond those obvious spaces. If you need built-in storage, shelving or custom case goods, no matter what the room or purpose, cabinetry experts can help. Their focus on details and space-planning skills can help you squeeze functionality from even the tiniest corners of your Copiague, NY home. Cabinetry professionals design, construct, refinish and repair banks of conventional cabinets, but they also create customized storage and shelving for home offices, playrooms, bedrooms, media rooms and other spaces. They’re in the know about New York design trends and different cabinet styles, as well as the latest in special inserts and other options that boost functionality. Cabinetry professionals also can craft furniture to your specifications, such as a corner cabinet for a kitchen or a dining room hutch. In addition, Copiague, NY cabinetry pros can help you give worn or dated cabinets a makeover. They can replace doors; add glass inserts, decorative moldings and other details; or give cabinetry a new coat of paint or specialty finish. Your cabinetry professional might work closely with a New York kitchen designer, builder, remodeling contractor or interior designer. Here are some related professionals and vendors to complement the work of cabinets & cabinetry: Kitchen & Bath Designers, Kitchen & Bath Remodelers, Interior Designers & Decorators, Closet Designers and Professional Organizers, Woodworkers & Carpenters. Find a cabinetry professional on Houzz. Narrow your search in the Professionals section of the website to Copiague, NY cabinets and cabinetry. You may also look through New York photos to find examples of cabinets that you like, then contact the cabinetry professional who worked on them.